Not everyone has the opportunity to invest in the stock market or a 401(k) benefit plan and not all of us can afford to take out a million dollar life insurance policy for the people we love. But everyone, regardless of age, salary or lifestyle, has the opportunity to make these five investments. While at first glance they might seem to have nothing to do with money, these investments can help us get rich in other ways, and in many cases they do lead to monetary reward. I personally encountered some health issues when I started having problems sleeping. I would go to bed at night and wake up exhausted every morning. This accumulation of sleep deprivation led to a junk food diet and lack of exercise because I was too tired to cook healthy meals or go to the gym. I was just trying to get through the day. Finally I went to the doctor, participated in a sleep study and got some help. I found out the reason for my problem – sleep apnea – and I started taking steps to turn things around. This one investment has vastly improved other areas of my life and led to greater production – aka, more money. It’s easy to take the people we see daily for granted, especially when we are in pursuit of some bigger goal. But relationship investments need to be replenished just like our bank accounts. The same advice I give to my clients who wait to save until they are making more money applies here to relationships: don’t wait until you can do more to start doing. Just start small by using whatever time you have, and make an investment right now, today, in the people who matter most to you. This can be in the form of a phone call, a dinner date or a backyard game of catch. Whatever form it takes, don’t put it off. Do it today. The retirees I work with all tell me the same thing: they wouldn’t trade their memories for all the money in the world. When was the last time you had a unique experience? These can be as small as taking a different route on the way home or as big as planning a trip for someone you love. Experiences don’t just happen; they have to be intentionally planned for. Think of something you’ve always wanted to do, and take one step today to move yourself closer to making that happen. If you feel like you have more to offer this world, if your current employment isn’t asking enough of you, of you know that you were made for more, than this investment is for you. Each of us has been given a unique set of giftings and talents. Your exact skills and interests are as unique as a thumbprint and beautiful as a snowflake. So what are you doing with your gifts? You can’t wait around for someone else to tell you who you should be. Deep down, you already know. I challenge you to do something today about this lack of fulfillment and take one step toward finding out how your gifts can support the life you want to live. My mentor, Steven D’Annunzio, shared his philosophy of viewing life as a school. When things go wrong or don’t work out, instead of viewing them as mistakes or failures, you look at them as lessons that haven’t been learned yet. Each time a lesson has to be repeated, it gets more painful until finally you get it, and you graduate to the next grade or level. What will you do with your mistakes and failures? Will you blame and complain? Hide? Give up? Or will you look for the lesson? I hope you choose to view life as a school. Look for the lesson, identify what you will do differently next time, and then move on. 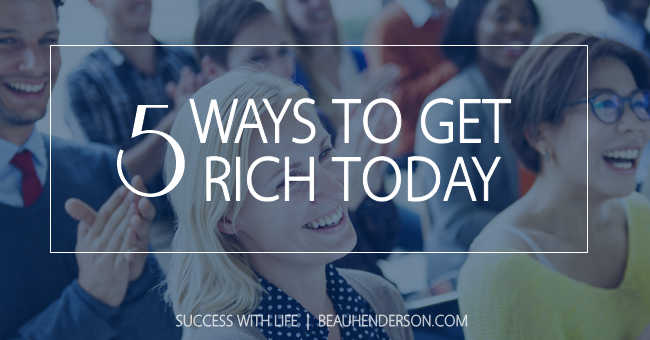 Choose to make at least one of these five investments today because you deserve to live a rich life. ← #CyberAware | What Should You Do If You’ve Been Scammed?